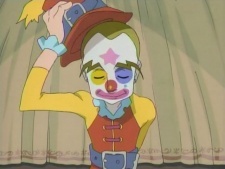 Abel is German and works as the Pierrot of the Troupe, in charge of comedy and laughter. He wears clown make-up while on stage, and performs all kinds of amusing antics such as juggling, acrobatics, and standing on a large ball. Even though he is the Pierrot, Abel can be very serious and wise at times. He is a very well educated man, somewhat of a scholar and mentor figure; he helps Nadja to look for books in libraries and reads her mother's diary, which is written in German, a language Nadja does not know since she has been raised in England. Behind Abel's Pierrot make-up lies a sad past and a family he had to leave behind; he was the doctor of an impoverished village, but spent a time in jail after stealing medicine from an hospital to save his patients from an epidemy and had to abandon his family after his release, since his son Stefan had the illness and was left in a wheelchair.